Reigning ACM Festival Of The Year – Country Thunder Arizona – Is Set To Rock This Weekend! | 2911 Enterprises, Inc. Reigning ACM Festival Of The Year – Country Thunder Arizona – Is Set To Rock This Weekend! Multiple ACM Award winners and nominees set to play country music’s best festival! FLORENCE, Ariz. – Reigning ACM Festival of the Year – Country Thunder Arizona – is set to bring a prime slate of country music superstars to their massive stage this weekend in Florence, Arizona. 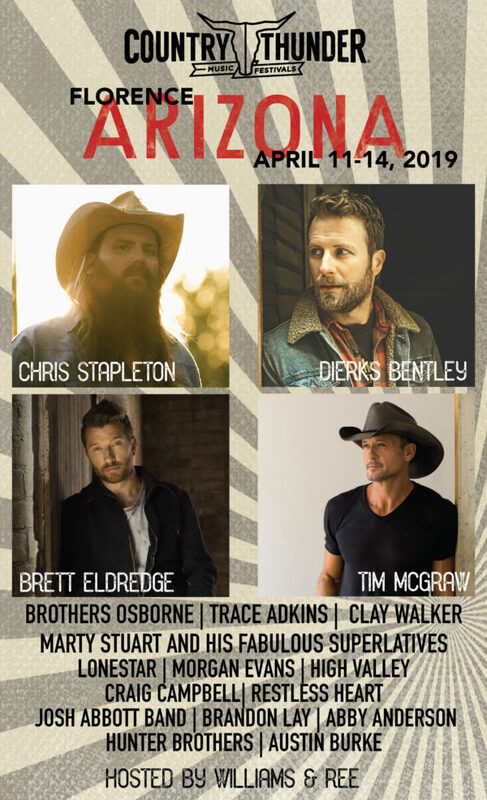 ‘All your favorite people’ are coming, including five-time Grammy, seven-time ACM and 10-time CMA winner Chris Stapleton (2019 ACM Nominee – Entertainer of the Year, Male Artist of the Year, Album of the Year and Song of the Year), making his first ever Country Thunder appearance! He joins headliners Dierks Bentley (ACM Winner – Music Event of the Year; ACM Nominee – Male Artist of the Year, Album of the Year and Video of the Year), Brett Eldredge and Tim McGraw, along with Brothers Osborne (ACM Winner – Music Event of the Year; ACM Nominee – Video of the Year), Trace Adkins, Clay Walker, Restless Heart, Lonestar, Marty Stuart and His Fabulous Superlatives, Morgan Evans, Craig Campbell, HIGH VALLEY (ACM Nominee – New Duo or Group), Hunter Brothers, Brandon Lay,Abby Anderson, Austin Burke,Josh Abbott Band, Scooter Brown Band, The Cole Trains, Harry Luge, and festival hosts Williams & Ree. Adding to the excitement of the massive main stage talent, Electric Thunder features an EDM throwdown featuring Lucy Voll, David Fanning and DJ Hish for the late-night party crowd. Festival-goers can enjoy daytime recovery Country Flow Yoga followed by line dancing instruction and Dancing With The Thunder swing dancing every day with a dance competition on Saturday. The Copperhead stage was also announced with a lineup featuring Harry Luge, Scooter Brown Band, The Cole Trains, Ryan and The Renegades, A Boy Named Sioux, Drew Cooper, Matt Farris, Julia Rizik, Lauren Mayell, Jessa and more! New for 2019, the world-renowned Budweiser Clydesdales will appear at 2 p.m. on Thursday and noon Friday through Sunday with a full-hitch parade through the campgrounds. ACT NOW! Four-day weekend passes, single day tickets, Platinum Experience upgrades, Glamping and all the extras are still available – but not for long! Visit countrythunder.com to purchase, or order by phone at 1-866-388-0007. Facebook, Twitter and Instagram all @countrythunder. Don’t forget to download the app – loaded with festival information, schedules and more. Once again, the clear bag policy will be in effect. Country Thunder Music Festivals has a 15-year history which boasts four other major multi-day events in North America. The organization also hosts festivals in Florida, Wisconsin, Alberta and Saskatchewan. Country Thunder Arizona 2019 is coming in hot – see you all there! If you’re parking on your campsite, you’ll need an extra vehicle parking pass. Click here for more information. If you’re driving and not staying overnight, you’ll need to purchase a day pass; we have single day and weekend day passes available. If you’re not parking on a campsite, but you are parking overnight, you’ll need to purchase a weekend reserved or weekend overnight parking pass.
.@ACMawards winning @CountryThunder Arizona #Festival is set to rock this weekend! Visit countrythunder.com for tickets & more info!